Some cookbooks you buy for the novelty factor- like the Momofuku MIlk Bar or Roberta’s cookbooks. Some cookbooks are for the purpose of learning and understanding more about a cuisine, like Marcella Hazan’s Essentials of Classic Italian Cooking or Mastering The Art Of French Cooking. And some you pick up because they’re on sale. Like I said, I love a great bargain. And when I come across a nice cookbook at a steal, it’ kind of hard to walk away. 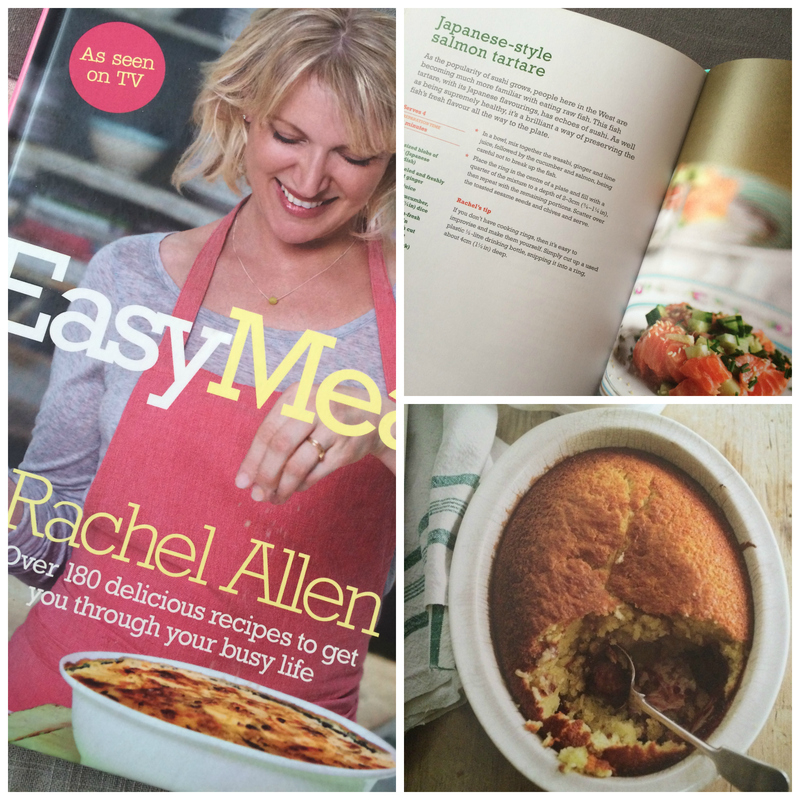 Which is how I ended up adding Rachel Allen’s Easy Meals to my collection. The first time I ever saw Rachel Allen was when her show Bake! aired on TLC India. I (kind of) assumed that she was solely a baker and pastry chef, and sweet treats and breads were all she did. It’s only later when I watched her Home Cooking and Easy Meals shows that I realized she is an all-round cook. I saw this book at a clearance sale and it was in great condition, and available at a really, really good price. There aren’t as many pictures as Bake! and All Things Sweet, but the recipes do stand up to their promise: they are easy, uncomplicated and from what I’ve tried so far, pretty flavourful. I’m a fan of pared-down cooking. Just a few quality ingredients and bright seasoning that shines through. 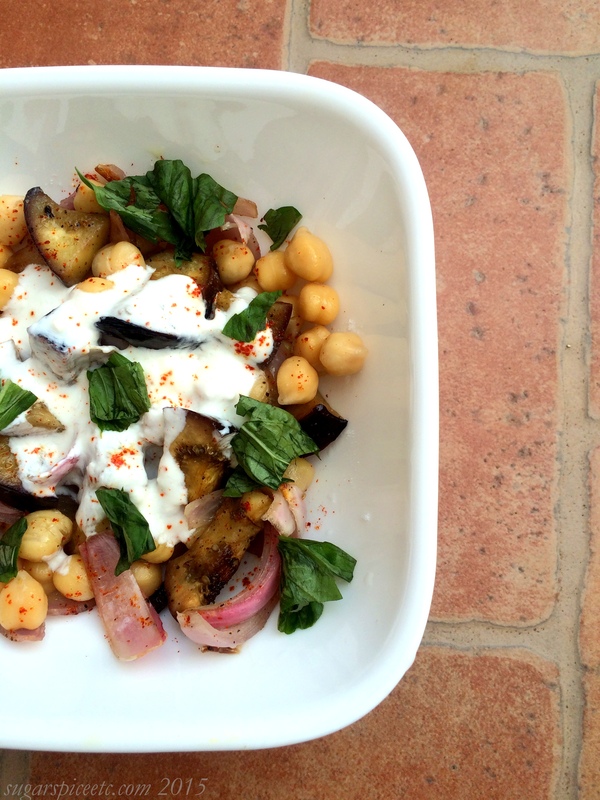 Since I’m all about salads these days, I made the chickpea and roasted aubergine salad. This one is from the Fast & Fabulous section of the book, recipes which take under 30 mins to prepare. The original recipe calls for rocket leaves, but I tore in some basil because I didn’t have any. I think cilantro would work really well, too. Preheat the oven to 220 C, set aside a shallow baking dish for the vegetables. In a bowl, toss the onion wedges and aubergines with the olive oil, salt and pepper. Mix well to combine. Tip the vegetables into a shallow baking dish and bake in the oven at 220 C for 20 minutes or until the vegetables are softened and lightly browned. To make the dressing, whisk together the yogurt, paprika and salt in a small bowl and set aside. Once the vegetables are done cooking, assemble the salad. In a large salad bowl, add the chickpeas and season with salt and pepper. Toss in the onions+aubergines, and mix well. Drizzle over the yogurt dressing, then scatter the torn basil leaves on top.